On September 28, 1971 the Council of Bishops convened in Montreal determined that non-Orthodox were to be accepted into the Church only by baptism. Our newly posted article, “The 19th Canonical Answer of Timothy of Alexandria: On the History of Sacramental Oikonomia,” deals with the notion of sacramental economy as it appears in this decision. The historical circumstances surrounding the appearance of this document have yet to be studied. Thus, St. Basil, and through his words and Ecumenical Council, established the principle that outside the Holy Orthodox Church there is no true baptism; he does, however, out of pastoral condescension, which is called “economy,” permit the acceptance of certain heretics and schematics into the Church without a new baptism. In accordance with such a principle, the Ecumenical Councils permitted the reception of heretics in various ways, taking into consideration the degree of the weakening of the heretics’ enmity against the Orthodox Church. In Russia since the time of Peter, I, [sic.- A.P. ], the practice was introduced to accept Roman Catholics and those Protestants who taught that baptism was a sacrament (e.g., the Lutherans) through a renunciation of their heresy and chrismation (Catholics who had been confirmed were received without chrismation). Before Peter, Catholics were baptized in Russia. In Greece, the practice has also varied, but for most of the past three hundred years, the practice of baptizing converts from Catholicism and Protestantism was reintroduced. Those received into the Church in any other way were sometimes not even recognized in Greece as Orthodox. There were many cases of such convert children of the Russian Church not being admitted by the Greeks to Holy Communion. Having this circumstance in mind and also the current growth of the ecumenical heresy, which attempts completely to erase the difference between Orthodoxy and any heresy as manifested by the Moscow Patriarchate’s decision in spite of the holy canons, even to permit Roman Catholics to take communion in certain cases, the Bishops’ Council deems it necessary to introduce a stricter practice, i.e., to baptize all heretics who come to the Church. Any other practice, i.e., the acceptance of Roman Catholics and Protestants baptized in the name of the Trinity into the Church through a repudiation of their heresy and the sacrament of chrismation, may be permitted only if strictly necessary. It must be with the express permission of a bishop and be motivated by considerations of “economy” or pastoral condensation. The lack of accord of the decision of the Moscow Patriarchate, concerning the granting of communion to Roman Catholics, with Orthodox doctrine and the Church canons, is completely clear to any person even slightly trained in theology. 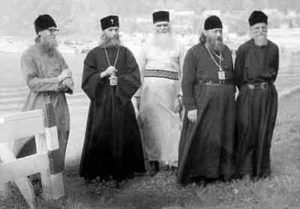 The Moscow decision was justly condemned by the Synod of the Church of Greece. The holy canons do permit the communication of a great sinner under epitimia when he is at the gate of death (I Ecumenical Council 13, Carthage 6, Gregory 2 & 5), but there is not even one canon which would extend this to include persons foreign to the Orthodox Church, so long as they have not renounced their false doctrines. No matter what attempts Metropolitan Nikodim and other Moscow hierarchs try to make to explain this act, it is completely clear that by this decision communion has been established between the Moscow Patriarchate and Roman Catholics, albeit with certain limitations. Furthermore, the Catholics have already decided to permit children of the Orthodox Church to receive communion from them. This (i.e., the state of communion between the Moscow Patriarchate and Roman Church) was particularly clearly demonstrated in the service held on December 14, 1970, in St. Peter’s Basilica in Rome when Metropolitan Nikodim gave communion to Catholic clerics. It is obvious that this act could not be justified by need (i.e., that the Catholics had no churches of their own at which to receive communion). By this act the Moscow Patriarchate betrayed Orthodoxy. If the 45th Canon of the Holy Apostles excommunicates from the Church an Orthodox bishop or cleric who has “only prayed together with heretics” and 10th Apostolic canon forbids Orthodox even to pray together with those who are excommunicated, what can we say about a bishop who dares to offer the Holy Mysteries to heretics? If catechumens must leave the church before the sanctification of the Gifts and are not permitted even at the point of death to receive communion until they are united to the Church, how can one justify the communicating of persons who are members of heretical communities and are much further away from the Church than a catechumen, who is preparing to unite with her? The decision of the Moscow Synod, which was confirmed by the recent Sobor of the Moscow Patriarchate in Moscow, extends the responsibility for this un-Orthodox decision to all participants of the Moscow Council and to their entire Church organization. The decision to admit Catholics to communion is an act which is not only anticanonical but heretical since it inflicts harm on the Orthodox doctrine of the Church, which holds that only true members of the Church are called to communicate of the Body and Blood of Christ in the Eucharist. Taken logically, the Moscow decision recognizes as members of the Patriarchate those who, through their doctrinal errors, are in both heart and mind far from Orthodoxy.